So much of what is said and written about Chicago's South Side is negative. South Side Talks Podcast is changing that narrative. The South Side is more than headlines and statistics. It is made of families, neighbors, artists, business owners, musicians, writers, friends, teachers, doctors, lawyers, and a host of others that make it a rich and diverse place. By continuing to label the South Side in ways that make it appear to be a dangerous place where violence, drugs and poverty are everywhere, it robs the residents of the South Side of their dignity. That narrative is far from the truth and the people of the South Side deserve more than to be constantly spoken about in bad headlines. 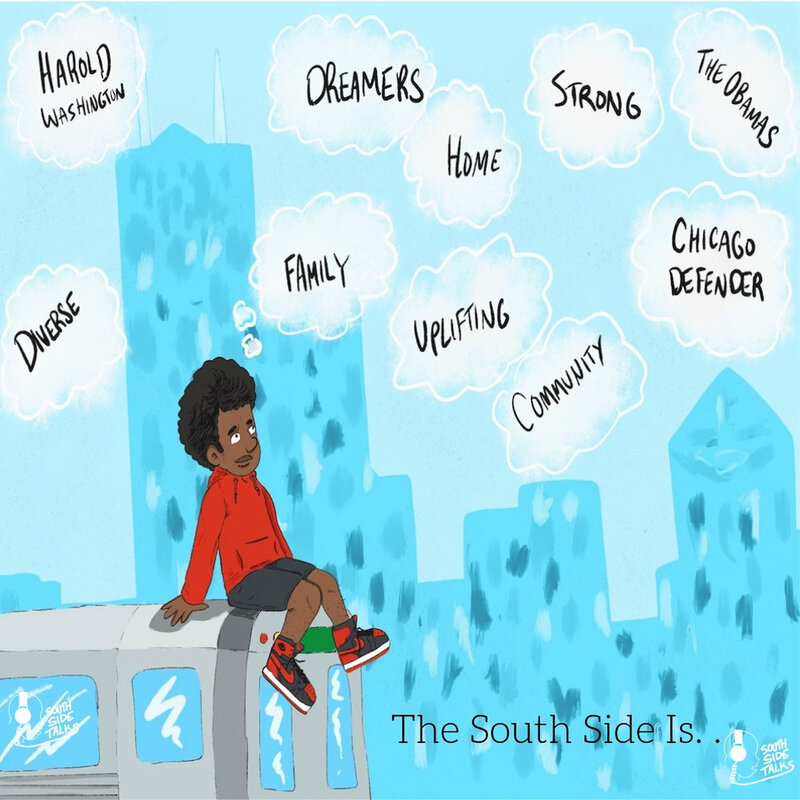 South Side Talks is a podcast that will bring you stories that represent ALL of the South Side. Stories of joy, pain, success, failure, humor, and everyday life. By telling these stories, it allows the residents of the South Side to be seen as they are and should be—as regular people who face life with the same ups and downs as anybody else. Julian Johnson is the founder and host of South Side Talks. Julian was born and raised on the South Side of Chicago and knows that it is more than what is reported in the news. After tiring of hearing the daily barrage of negative reports about his community, Julian decided that he would launch a platform that allowed the people of the South Side to control the narrative spoken about them. Thus, South Side Talks was born. Julian is a lawyer and still lives on the South Side. He received his undergraduate degree from Howard University and a law degree from Southern University Law Center. THE SOUTH SIDE IS. . . The South Side is family. It is the Great Migration and legacy. It is historic, determined, resilient and prosperous. It is a community of hardworking people who look towards the future everyday. Continuing to speak about the South Side in negatively charged terms weakens the vibrancy of the community. It robs the people of the South Side of their dignity when the place they love and call home, their social networks, and community bonds are constantly diminished. Despite what they say, the South Side is not a war zone. It is not filled with violence. It is someone's home and it means something to them. We want to hear from you. Click the link below and brag about your community. Tell us what the South Side Means to you. The South Side To Me Is. . . .
You can listen to the latest episodes on Apple Podcasts, Stitcher, Google Play, Spotify, or on our site. Be sure to subscribe to us so you’ll automatically be notified when new episodes drop. Help us get the word out by telling your family and friends about the show. We’d appreciate it. South Side Talks is dedicated to telling the stories of the people of the South Side of Chicago. And in case you’re wondering, yes, we want stories from the West and North Side too. Everyone has a story to tell and we want to hear from you and help you tell yours. It doesn’t matter what your story is. Whether it’s a story of joy, pain, success, failure, struggle, or overcoming, it deserves to be told. Your Story is trying to say something. You want to the listener to take something away from your story. Your Story has characters. Who are the people in your story? Your Story has parts. Even if there is no resolution, your story still needs a beginning, middle and end. Your Story should be the truth. It should be your story and told from your perspective. Your Story should have some connection to the South Side or Chicago. Write a short paragraph describing your story. Do you have a comment or just want to say hello? We'd love to her from you. Click the link below to contact us. Help us to keep making the show by supporting us with a donation. Your support is greatly appreciated.